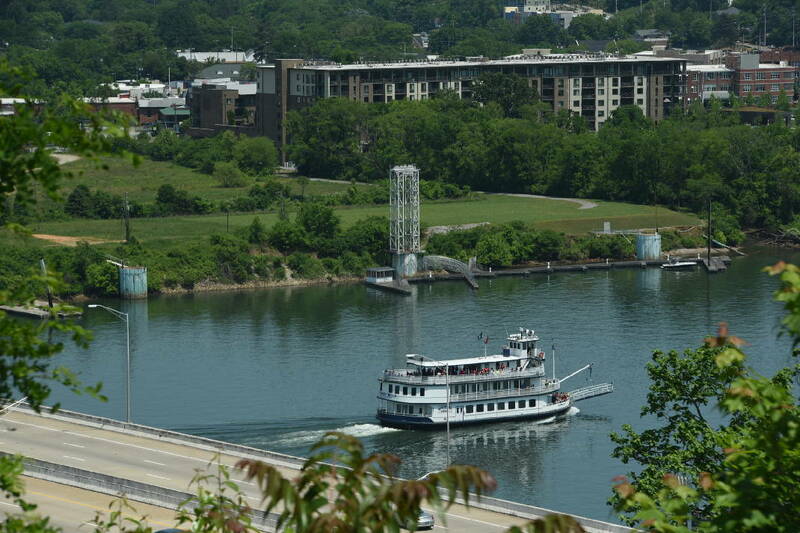 The Southern Belle riverboat moves upstream on the Tennessee River in this view of the land behind the former Casey barge that can now be seen by Chattanoogans. Four years after a valuable vacant tract on Chattanooga's downtown riverfront slid into bankruptcy court, the parcel tied to businessman Allen Casey has sold for $5.5 million. The buyer, American River Development LLC of Chattanooga, had been one of two companies which emerged in long-running efforts to sell the 6.6-acre site that sits off Manufacturers Road and across the Tennessee River from Ross's Landing. › 2009: Businessman Allen Casey floats a barge to downtown Chattanooga and docks it next to a tract of land he owns. He plans to set up a restaurant and develop the parcel, but nothing happens. › 2011: Barge sinks and sets off a multi-year effort to rid the dilapidated vessel from the riverfront. › 2014: Casey and a Casey company file bankruptcy. › 2015: Barge is floated away to the Gulf of Mexico. › 2016: Agreement reached in bankruptcy court with North Carolina firm to sell 6.6 acres of Casey land for $5.9 million, but the deal falls though. › 2018: 6.6-acre tract sold for $5.5 million. American River, led by Chattanooga developer John Clark, could eventually sell the property to Boca Raton, Fla.-based Halvorsen Holdings, said Jerrold Farinash, trustee in Casey's bankruptcy case. Farinash said Halvorsen, a developer of commercial projects that late last year became the leading candidate for the land, is still working through its due diligence on the tract. "I suspect American River is working to sell it to [Halvor- sen]," he said. If that deal doesn't happen, then American River could ultimately develop the land or sell it, Farinash said. He said it was time for the case, filed in February 2014, to get out of bankruptcy court. "I needed the case done," said Farinash, who became trustee three years ago and oversaw the removal of a controversial, dilapidated barge that Casey had earlier brought to the site. Chattanooga attorney Gary Patrick, representing a group of former investors who had sued Casey, said his clients will have a partial recovery. "It was a very fair settlement. It was a long time coming," he said, adding that he had been involved in legal wrangling over the property for at least five years. Development of the vacant tract will be favorable for Chattanooga, Patrick said. He said the site could hold both retail and some form of residential development. Commercial projects could go on Manufacturers Road with residential space, potentially apartments, nearer to the river. The sale price of the land is one of the highest for a downtown tract, according to officials. The Casey property is part of an 11-acre tract that sits in a key spot nearly directly across from the Tennessee Aquarium. The other part is owned by Chattanooga businessman Jackson Wingfield. In 2009, Casey brought a barge to the city to put in a floating restaurant and bar, but that project fizzled and the vessel deteriorated over the years. In the summer of 2015, the removal of the rundown barge, long a point of criticism for its derelict state, was seen as making the land easier to sell. Casey, who developed the Chattanooga Choo Choo into one of Tennessee's top attractions decades ago, and one of his companies filed for bankruptcy in 2014 as he faced a civil trial related to the lawsuit brought by the former investors. This story was updated Feb. 15, 2018, at 10:42 p.m. with more information.